Partners in Crime starts off on the waning days of World War 2. A conspiracy is set forth by the Japanese government to obtain a particular item and two men are sent to retrieve it. The unlikely pairing of two Americans, one an expert jewel thief and the other an insurance fraud investigator, begin their adventure into post war Germany. There, they barely escape with their lives and the item they were sent after. Unfortunately, by the time they return to America the war has ended with the blasting of Japan with atomic weapons. As the company was a front for Japanese interests it was closed. The pair were still paid what they owed with a bit extra, the result that the conspirators had hoped for was not realized. The contested item is the Moon of Kali, the largest black star sapphire in the world. It has a long and sordid history, the sort of history best described as ‘cursed’. For thousands of years it has left a trail of dead owners in its wake and tantalizing tales of its power. In World War 2, the Moon of Kali was captured by the Germans, who had sought out such mystical items. The Japanese saw the imminent fall of their allies and wished to use the Moon of Kali to safeguard their homeland. 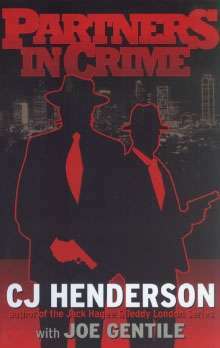 The novel jumps repeatedly in sequence of events at the start and the writers seemed to have a firm hold on the pulp era, I would have greatly enjoyed an entire story set in this turbulent time that delved further into the exploits of Blackie and Dollar, the jewel thief and fraud investigator, as they worked to obtain the Moon. The pair were never mentioned again, and seemed to merely be a footnote in the history of the sapphire. The story then jumps ahead several decades and we are introduced to a litany of new characters. The previous three characters are replaced by Lai Wan, a psychometrist, Keen, a finder of lost people, Hagee and Novak, both security people assigned to protect the sapphire, and Carl Kolchak, a reporter on the super-natural. Partners in Crime shifts focus from Lai Wan and Keen over to the other three quite often. There is also Stranger, Lai Wan’s dog, who is able to speak to Lai Wan due to her mental abilities. His communication came as quite a surprise to her, as he had not spoken before. He informed her that this was because she had never asked him a question and that most humans couldn’t ‘hear’ the thoughts of a dog. However, she was a good companion and could hear him.. after all, she gave good treats. While I had trouble identifying with Lai Wan and Keen, the addition of Carl Kolchak tweaked my fan-boy nature to the extreme since I adored the series. The two groups set about their tasks oblivious to each others existence. Lai Wan, having had a prophetic dream, had recruited Keen to find a Japanese official named Moto while she searches for the Moon of Kali. Lai informs Keen of the dire nature of what is about to happen and the extremely short time table that is being observed. While Lai and Keen search, Hagee and Novak are on duty to keep a museum exhibit, of which the Moon is a part, safe. They are joined by Kolchak, crumpled hat and all, as he attempts to break the story of the Moon before anyone else is able to. Soon both groups are embroiled in conflict. The lights at the museum are snuffed out and a battle ensues. Through luck, skill, and the help of another old friend those at the museum prevail and keep the Moon from falling into the hands of the evil that sought it. The secondary group faces the bulk of their issues in an alternate plane of existence. It is a dimension where willpower controls everything and thought has power. Wan called it the Dreamplane, a realm few knew existed or could accept that it existed. The modern characters took some getting used to, and the only time the pace of the story slowed was at the onset of the second part. Although we, the readers, knew what was basically happening, those in the story had to go through a round of exposition on the Moon. Thus the tale is bogged slightly as they retell the history of the sapphire. Once that small portion is past, things quickly began picking up steam again. Each character was intriguing in their own way, and if one is interested further exploits are available for Kolchak, Blackie, Wan, Keen, Hagee, Blackshirt (an associate of Hagee that came to their aid), and Novak. What I thought was going to be a rather mundane mystery that was occasionally spiced up with a little mysticism turned into an enthralling tale. It retained a hard edge despite its fanciful fringe elements that left the more mundane characters somewhat befuddled. Partners in Crime was an excellent read, with only a few chapters that seemed to act like a speed bump. It was entertaining, engaging, and the characters involved were fascinating enough that I would happily seek out their individual works of fiction.